The massive asteroid 1998 QE2 will pass 6.2 million kilometres (3.8 million miles) from the Earth on Friday, May 31st 2013 at 4:59pm EDT (20:59 UT.) We believe 1998 QE2 is as large as 9 times the size of the 12-decked cruise liner Queen Elizabeth II (QE2 :). A hypotethical impact from an asteroid this big would be catastrophic… but no worries this time. The passage is over 15 times as distant as the Earth’s Moon. “QE 2” is not an homage to England’s Queen Elizabeth II. Newfound asteroids are named according to an established alphanumeric scheme that lays out when it was discovered. The asteroid will be cruising through the Hydra constellation on its way north into Libra on Friday 31th. You might actually be able to see it, if you happen to have access to a decent telescope as the asteroid will never top +10 magnitude – which is the general threshold for binocular viewing under dark skies. The asteroid will look like a tiny moving star-like point. Update May 30th, 2:32 PM Eastern: The asteroid has a moon! Here’s a stunning video from NASA’s JPL of the asteroid that reveals a satellite orbiting it. I found asteroid 1998 QE2 last night (June 3-4). It passed very close the the very bright star Yed Posterior in Ophiuchus (only about 5 arc minutes northwest). It appeared fainter than the predicted magnitude of 11.37. I estimated the brightness to be 11.6 magnitude. 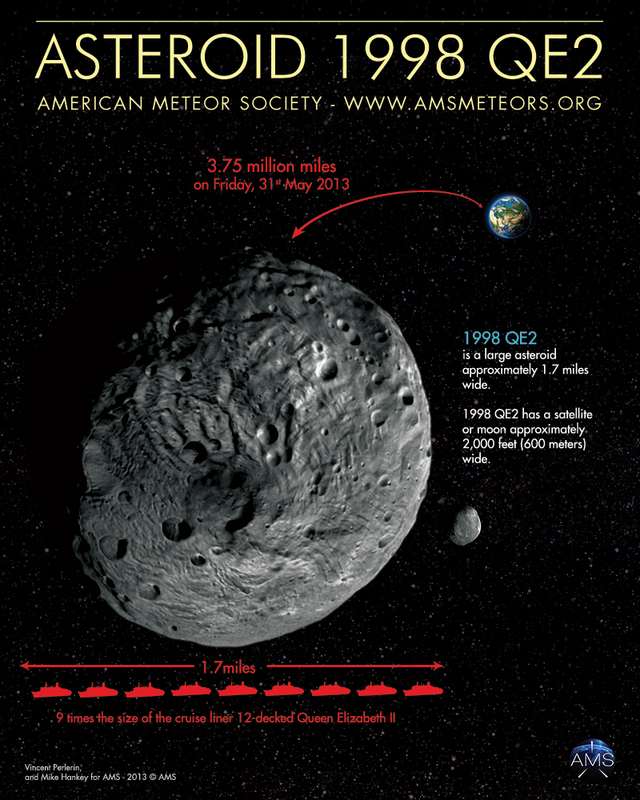 Didn’t the asteroid 1998 QE2 earn its designation because of when it first was tracked? It seems to me that I remember such a report during JCSBATGRU98-2 global deployment. You are correct. Asteroids are designated by the year and month they are discovered.